← Readdle’s Birthday Gift – Scanner Pro App Price Reduction ! Familiar with Co:Writer software, the word prediction software from Don Johnston, Inc.? It’s gone mobile – the Co:Writer app is now available for iPhone/iPad (17.99). Co:Writer predicts the intended word with a selection of word suggestions using powerful grammar-smart word prediction. These suggestions can be read aloud with a swipe. Selecting the intended word places it into the document. 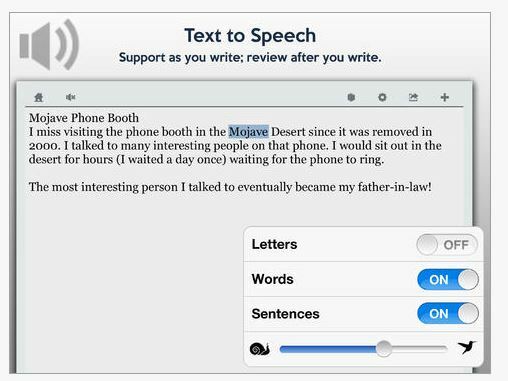 For feedback while writing (and after writing) built-in text to speech can be used to read letters, words, sentences, and the entire document. Co:Writer has access to a main prediction dictionary (that includes core words) and Topic Dictionaries (that includes topic specific words). Co:Writer handles the widest range of spelling mistakes through its Flexspell™technology including phonetic spelling and inventive spelling errors (letter omissions, word ending omissions, letter reversals, etc). 1. The blk jargon flu over the bra lfnt. 2. R u hpy to ce me? 3. I no hw to nor the fone. 1. The black dragon flew over the gray elephant. 2. Are you happy to see me? 3. I know how to answer the phone. Co:Writer bases its prediction off of proper grammar, and uses its understanding of grammar to accurately predict words within the framework of valid sentence structures. 2. Three very mangy dogs ran down the street. (adj., adv., adj., noun, verb… etc.) – After typing three, very, mangy, you get plural noun choices, then you get plural verb tenses. Work Flow options includes Dropbox, Google Drive, social media, email, messaging, printing and saving/copying (?) from Co:Writer . Great options for schools. 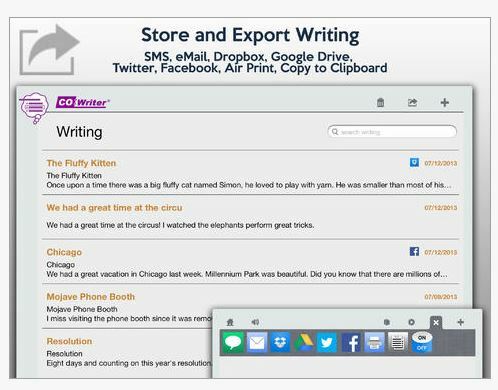 Many of the features of the desktop software appears integrated into the Co:Writer mobile app. Sure hope to give it a drive soon. Has anyone had a chance to trial it? This looks like a great addition to a students, teachers or OT mTool Kit ! Wouldn’t it be great to have Draftbuilder on a mobile device??? 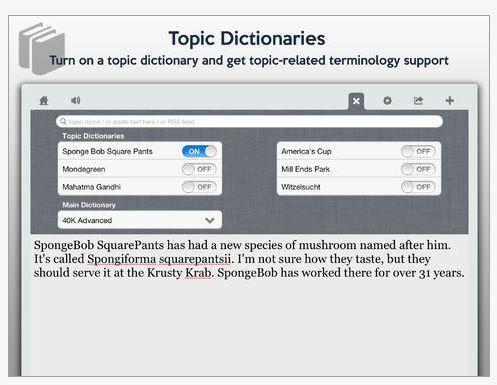 This entry was posted in App Reviews, Apps for OT's, AT for Handwriting, Customizable app, Elementary School, High School, iPad, iPhone, iPod, Language Arts, Learning Disability, Middle School, Occupational Therapy, School Based Interventions, Spell Checking, Text to Speech, Word Prediction, Writing and tagged App Review, iPad, iPhone, iPod, Learning Disability, OT Apps, special needs students, Word Prediction, Writing. Bookmark the permalink.